This article is about the city. For the fictional character, see The Sheltering Sky. Port Moresby (/ˈmɔːrzbi/; Tok Pisin: Pot Mosbi), also referred to as Pom City or simply Moresby, is the capital and largest city of Papua New Guinea and the largest city in the South Pacific outside of Australia and New Zealand. It is located on the shores of the Gulf of Papua, on the south-western coast of the Papuan Peninsula of the island of New Guinea. The city emerged as a trade centre in the second half of the 19th century. 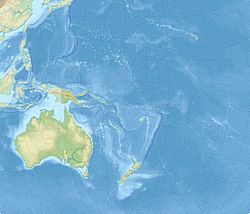 During World War II it was a prime objective for conquest by the Imperial Japanese forces during 1942–43 as a staging point and air base to cut off Australia from Southeast Asia and the Americas. In 2000 it had a population of 254,158. As of 2011[update], it had a population of 364,145, giving it an annual growth rate of 2.1% over a nine-year period. The place where the city was founded has been inhabited by the Motu-Koitabu people for centuries. The first Briton to see it was Captain John Moresby in 1873. It was named in honour of his father, Admiral Sir Fairfax Moresby. 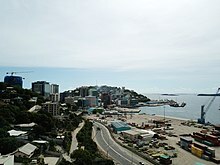 Port Moresby hosted the APEC summit in November 2018, however there were concerns about security given the capital's reputation for violent crime. The Motuan people of the area now known as Port Moresby traded their pots for sago, other food and canoe logs, sailing from Hanuabada and other villages built on stilts above the waters of the bay. Their language, Motu, was the basis of Hiri Motu, an official language of Papua New Guinea. It has been steadily in decline since the 1960s when Tok Pisin (till then confined to the northern side of the former border between Papua, British New Guinea until 1905, and New Guinea, that was German New Guinea until 1914) began to grow in popularity. The Hiri expeditions were large scale. As many as 20 multi-hulled canoes or lakatoi, crewed by some 600 men, carried about 20,000 clay pots on each journey. To the Motuans, the Hiri was an economic enterprise and it confirmed their tribal identity through its long and dangerous voyages. Government House in Port Moresby—still used today though substantially enlarged and altered—, at the beginning of 20th century. In 1905 the recently federated Australian government passed the Papua Act which came into effect in 1906. 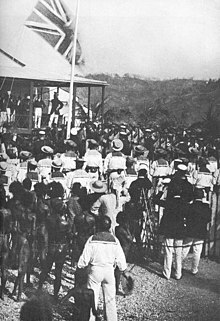 The act transferred Papua, with Port Moreseby as its capital, to direct Australian rule. From then until 1941 Port Moresby grew slowly. The main growth was on the peninsula, where port facilities and other services were gradually improved. The first butcher's shop and grocery opened in 1909, electricity was introduced in 1925, and piped water supply provided in 1941. Douglas Street, Port Moresby: Old hotel lot, vacant for 30 years, and new building behind it. During World War II, some Papuan men enlisted in the Papua Infantry Battalion and others as carriers over trails and rough terrains (porters) as supply support to Allied and Japanese armies during long jungle marches. Historian William Manchester makes it plain in his biography of General Douglas MacArthur, American Caesar, that acting as porters was well down the natives' list of acceptable voluntary activities and that they would fade away without great inducements. Many Papuan residents of Port Moresby either returned to their family villages or were evacuated to camps when the threat of Japanese invasion loomed. The city became, by September 1942, home to an important Allied complex of bases and thousands of troops were eventually stationed in the area or more often, staged through it, as it was the last Allied bastion on the island and, conversely, a key staging and jumping off point as the Allies began conducting offensive warfare themselves, pushing back the Japanese advances. The longstanding downtown United Church with next door office building in 2013 were replaced with one building, the church on the ground floor. In September 1975, Papua New Guinea became an independent country with Port Moresby as its capital city. Prince Charles, Prince of Wales, represented the Queen of Papua New Guinea at the celebrations. New government, intellectual and cultural buildings were constructed in the suburb of Waigani to supplement and replace those of downtown Port Moresby. They included those for government departments, including a National Parliament Building, which was opened in 1984 by Prince Charles and blends traditional design with modern building technology. The Papua New Guinea National Museum and National Library are in Waigani. A mansion was built in Port Moresby just west of the old legislative building but the last pre-independence chief minister and first prime minister of the sovereign state declared it not nearly grand enough; it was made the residence of Australian high commissioners and a mansion suitable to Somare's demands was built in Waigani. Several of the government buildings have been abandoned due to long-term neglect. Chief amongst these are Marea Haus (known to most locals as the "Pineapple Building") and the Central Government Offices. Nearby buildings, such as Morauta Haus and Vulupindi Haus, are starting to show significant signs of decay due to a lack of maintenance. However, widespread restoration rather than demolition of long-disused office buildings has been highly active since the first decade of the 21st century. 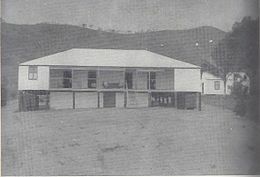 The legislative building before independence and the first parliament building is long-gone but the old court house in town Port Moresby remains, bearing its pre-independence label with its previous title. The population of the Port Moresby area expanded rapidly after independence. In 1980, the census return registered a population of 120,000; by 1990, this had increased to 195,000. Port Moresby has a tropical savanna climate (Köppen: Aw) with relatively constant temperatures throughout the year. Port Moresby’s average yearly rainfall is just over 1,000 millimetres or 39.37 inches, making it the driest place in New Guinea. The wet season starts in December and ends in May; the dry season covers the remaining six months, and, like the area around Townsville in Queensland, is due to the southeasterly trade winds running parallel to the coast, and the city being surrounded by high mountains. Average daily high temperatures range from 28 to 32 °C (82.4 to 89.6 °F) depending on time of year, while the average low temperature shows very little seasonal variation, hovering around the 23 °C (73.4 °F) mark. It tends to be slightly cooler in the city during the dry season. 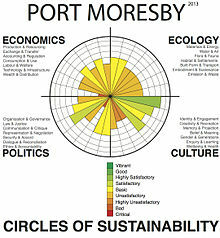 Urban sustainability analysis of the greater urban area of the city, using the Circles of Sustainability method of the UN Global Compact Cities Programme. Port Moresby is the single district of the National Capital District, which contains three Local Level Government (LLG) areas. For census purposes, the LLG areas are subdivided into wards and those into census units. Port Moresby refers to both the urbanised area of the National Capital District and more specifically to the main business area, known locally as "Town". Since the 1990s the original town centre has ceased to have restaurants and night life, though it is very successful and prosperous looking as an office centre. The affluent housing region north of downtown along and up from the coast remains so, though there are now few modest residential houses, most of which are replaced with substantial mansions and apartment buildings. The suburb of Boroko, once the commercial heart of Port Moresby, is very idle, with many former shopping buildings now empty; the west is full of high rises, shopping centres and affluent housing. 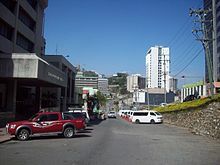 Other neighbourhoods of Port Moresby include Koki, with its popular fresh produce market, Newtown, Konedobu, Kaevaga, Badili, Gabutu, Kila Kila, Matirogo, Three Mile, Kaugere, Sabama, Korobosea, Four Mile, Hohola, Hohola North, Boroko, Gordons, Gordons North, Erima, Saraga, Waigani, Morata and Gerehu. There are villages like Hanuabada, the largest in Papua New Guinea. Parts of Port Moresby have security problems with house break-ins being the main problem. Fences topped with razor wire, security lighting, alarm systems, guard dogs, locked gates and walls are considered necessary around houses and apartment buildings. Carjacking is now rife in the capital and stopping at the few functional traffic lights is not recommended after dark when marauding gangs gather at the intersection(s). Security guards are widely employed as the police force is under resourced and weakened by internal corruption. Travel by foot is not recommended in and about the city and suburbs due continuing breakdown in law and order. The UN Global Compact Cities Programme, using a method called Circles of Sustainability has assessed the urban security of Port Moresby as 'critical'. Jacksons International Airport, looking east across the airstrip. Port Moresby is served within the city by buses and privately owned taxis. Flights are vital for transport about the country, highways not being widely available. 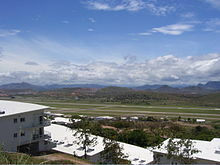 Port Moresby is served by Jacksons International Airport, the biggest international airport and Papua New Guinea Defence Force Air Wing base in the country. Air Niugini and Airlines PNG conduct regular domestic and international services from the airport, while Virgin Australia and Qantas fly to Brisbane. Jacksons has international flights to Brisbane, Cairns, Cebu, Sydney, Honiara, Nadi, Port Vila, Manila, Bali (Denpasar), Singapore, Hong Kong and Tokyo. As the national highway system is not fully linked, there are many internal flights to other towns, such as Lae and Madang, which have no direct road connection to Port Moresby. Papua New Guinea is rich in natural resources, which account for two thirds of their export earnings. Though PNG is filled with resources, the lack of development led foreign countries to take over some sites. Continuing foreign demand for PNG's resources led the United States to set up an oil company that began to export in 2004. This was the largest project in PNG's history. The project increased the potential to triple PNG's export revenue. Papua New Guinea gained much assistance from Australia and was offered two hundred million dollars a year in aid, and many countries such as Singapore, Japan and China have also played a great part in PNG's industry business. The decision to host the 2018 APEC meeting, bringing a large number of world leaders to Port Moresby, indicates the speed with which Port Moresby is entering the world economy. In recent years Port Moresby has been economically booming. There has been substantial building of housing, office towers, shopping malls and commercial establishments over much of it. The waterfront area has been completely redeveloped with apartments, restaurants and shopping centres. Sporting facilities were upgraded significantly for the 2015 South Pacific Games, and further development is took place in preparation for the 2016 FIFA Under-20 Women's World Cup. Airlines PNG has its head office on the grounds of Jacksons International Airport. The Jacksons International Airport was redeveloped and is to be further developed in time for the APEC Heads of Government meeting in 2018. 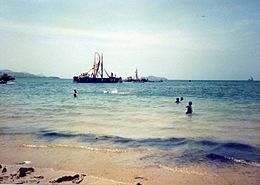 The 1969 South Pacific Games, held from 13–23 August 1969 at Port Moresby, were the third South Pacific Games to be held. A total of 1,150 athletes participated. The 1991 South Pacific Games held from 7–21 September 1991 at Port Moresby and along Lae were the ninth South Pacific Games to be held. This was the first time that events at one games had been held in two cities. The decision to do so was to allow both locations to benefit from the construction of new facilities. Cricket PNG is the official governing body of the sport of cricket in Papua New Guinea. Its current headquarters is in Port Moresby. Cricket PNG is Papua New Guinea's representative at the International Cricket Council and is an associate member and has been a member of that body since 1973. It is also a member of the East Asia-Pacific Cricket Council. The 2015 Pacific Games was held in Port Moresby from 4 to 18 July 2015. In September 2009, the Pacific Games Council, at its meeting coinciding with the 2009 Pacific Mini Games, elected Port Moresby as the host of the 2015 Games. The final vote was 25-22 in favor of Port Moresby over Tonga to host. The 2015 Pacific Games involved 24 different countries from the pacific regions with 28 different sports events including; basketball, soccer, touch rugby, table tennis, weight-lifting, triathlon, swimming, cricket, squash, shooting, sailing, va'a, rugby 7s, power-lifting, rugby league 9s, volleyball, beach-volleyball, athletics, hockey, netball, karate, lawn bowls, body building, boxing, softball, taekwondo, golf and canoeing. Papua New Guinea ranked first with the most medals followed by New Caledonia and Tahiti. The opening ceremony took place on the 4th of July 2015 involving various of traditional dances. The closing ceremony involved singers such as J Boog, Fiji, O-Shen and George Mamua Telek. Sir John Guise Stadium is the premier sports venue with a capacity of 15,000. It was completely rebuilt in 2015. Amini Park is a cricket ground in Port Moresby. The ground is named for the Amini family, several of whom have played cricket for Papua New Guinea (both the men's and women's teams), the ground has seen the men's team play Australia, the West Indies and Victoria. The women's team played Japan in a three match series at the ground in September 2006. Lloyd Robson Oval is a sporting ground in Port Moresby and has hosted 3 games for the 1989–1992 Rugby League World Cup. It has been the home ground for the Papua New Guinea national rugby league team since 1975. It has a total capacity of approximately 17,000. National Football Stadium - Papua New Guinea's National Football Stadium, formerly known as Lloyd Robson Oval, is located in Port Moresby and hosted three matches for the 2017 Rugby League World Cup. The venue (Loyd Robson Oval) was completely redeveloped in 2015 and has an all-seated capacity of 15,000. This was completed in time for the Pacific Games. The venue has hosted the PNG national side since 1975 and has previously hosted Rugby League World Cup matches in 1986 and 1990. It is also home of the Hunters, the local Papua New Guinea team who play in the Intrust Super Cup which is the Queensland NRL tournament. The National Football Stadium features a permanent main grandstand with seating for 3,000 including a roof and corporate facilities while temporary stands around the ground boost the seating capacity. There are also lights and a video screen. PMRL Stadium is a football stadium in Port Moresby and it is used mainly for football and hosts the home matches of PRK Hekari United of the Papua New Guinea National Soccer League and OFC Champions League. The stadium has a seating capacity of 15,000 spectators. Hubert Murray Stadium is a sports venue located in Port Moresby and was developed for the 1969 South Pacific Games on reclaimed land at Konedobu that had previously been shoreline mangroves. The athletics events and the opening and closing ceremonies were held at the new stadium, which was named after Sir Hubert Murray, a former lieutenant governor. In 2015-16 it was completely rebuilt as a large capacity football ground. The International Education Agency provides private education via six international schools; Korobosea International School, Boroko International School, Ela Murray International School, Gordon International School, Port Moresby International School and IEA TAFE college. There are approximately three hundred staff. The Port Moresby International School (POMIS) has been operating since the 1950s. It is an International Education Agency school and is the premier international high school in Port Moresby. It enrolls nearly 1000 students from Grades 7 to 12. 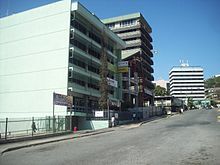 Port Moresby Japanese Language School (ポート・モレスビー補習授業校 Pōto Moresubī Hoshū Jugyō Kō) was a supplementary Japanese school in the city. It closed in August 2009. ^ "citypopulation.de". citypopulation.de. Retrieved 2010-04-25. ^ a b Tlozek, Eric (30 June 2018). "Security in PNG's Port Moresby under spotlight as APEC summit approaches". ABC. Port Moresby. Retrieved 3 June 2018. ^ "March of Civilisation". The Argus. The Argus Office, Melbourne Victoria. 7 September 1909. p. 5. Retrieved 29 November 2009. ^ "Progress in Papua". The Argus. The Argus Office, Melbourne Victoria. 5 September 1925. p. 12. Retrieved 29 November 2009. ^ "Department of the Interior: Tenders". The Argus. The Argus Office, Melbourne Victoria. 25 January 1941. p. 18. Retrieved 29 November 2009. ^ "Australian War Memorial - AJRP Essays". Ajrp.awm.gov.au. Retrieved 2010-04-25. ^ American Caesar, William Manchester, 1978, Little Brown Company, 793 pages, ISBN 0-316-54498-1, pp.306: "On and about Jul-Sep 1942 and MacArthur's troops stop the Japanese in the difficult jungles of New Guinea and General Kenney gifts Port Moresby to the SAC by moving the bomber line 1,800 miles [2,900 km] to five new air bases." ^ "Amazon.com listing for the "Four Corners: A Journey into the Heart of Papua New Guinea"". ^ Salak, Kira. "Nonfiction book about Papua New Guinea,"Four Corners"". ^ American Caesar, William Manchester, 1978, Little Brown Company,793 pages, ISBN 0-316-54498-1, pp.290-307: "On and about Feb-Dec 1942 and MacArthur's reorganization of troops, lack of theater priority, his support for Guadalcanal and his daring offensive gamble in going to meet the Japanese in the difficult jungles of New Guinea as a way of conducting a forward defense of Australia, rather than risk a war of maneuver when he had insufficient forces to move around." ^ "World Weather Information Service — Port Moresby". World Meteorological Organization. Retrieved 29 January 2016. ^ "Klimatafel von Port Moresby (Flugh.) / Papua-Neuguinea" (PDF). Baseline climate means (1961-1990) from stations all over the world (in German). Deutscher Wetterdienst. Retrieved 29 January 2016. ^ "Station 92035 Port Moresby W.O." Global station data 1961–1990—Sunshine Duration. Deutscher Wetterdienst. Retrieved 29 January 2016. ^ James, Paul; Nadarajah, Yaso; Haive, Karen; Stead, Victoria (2012). Sustainable Communities, Sustainable Development: Other Paths for Papua New Guinea (PDF). Honolulu: University of Hawaii Press. ^ FIFA.com. "FIFA U-20 Women's World Cup Papua New Guinea 2016 - FIFA.com". FIFA.com. Retrieved 2016-08-29. ^ "APNG Contacts Archived 2009-09-13 at the Wayback Machine." Airlines PNG. Retrieved on 26 May 2010. ^ a b Hawthorne, Stuart (2011). Taim Bipo. Boolarong Press. pp. 88–89. ISBN 978-1-876344962. Retrieved 15 May 2015. ^ Wightman, Brian (1992). "Ninth South Pacific Games in Port Moresby" (PDF 0.4 MB). Olympic Information Cente. pp. 50–53. Archived (PDF) from the original on 15 May 2015. Retrieved 15 May 2015. ^ PNG2015 - Papua New Guinea Wins, published by the Pacific Games Council, on 8 October 2009. Retrieved 8 October 2009. ^ "The Pacific Games 2015 – Port Moresby - The Pacific Games 2015 – Port Moresby". www.portmoresby2015.com. Retrieved 2016-03-14. ^ "Opening ceremony to bring PNG's history to the present - The Pacific Games 2015 – Port Moresby". www.portmoresby2015.com. Archived from the original on 2016-03-03. Retrieved 2016-03-14. ^ "Port Moresby says goodbye to an 'outstanding' Pacific Games - The Pacific Games 2015 – Port Moresby". www.portmoresby2015.com. Retrieved 2016-03-14. ^ "IEANet". www.ieanet.net. Retrieved 2016-03-14. ^ West, Christopher. "Port Moresby International School" (PDF). Port Moresby International School. iea.net. Retrieved 2016-03-14. ^ "大洋州の補習授業校一覧" (). MEXT. February 13, 2002. Retrieved on April 7, 2015. "ポートモレスビー Port Moresby Japanese Language School c/o Embassy of Japan P.O. Box 1040 Port Moresby P.N.G." ^ "関係機関へのリンク" (Archive). The Japan School of Doha. Retrieved on March 31, 2015. "ポート・モレスビー補習授業校（2009年8月休校）" and "（ニューメキシコ）アルバカーキ補習授業校（休校）" and "（プエルトリコ）プエルトリコ補習授業校（2006年3月閉校）"
Hugh Norwood Port Moresby Research Materials MSS 139. Special Collections & Archives, UC San Diego Library. 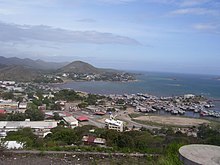 Wikimedia Commons has media related to Port Moresby.